Home » Jewelry Armoires » What is the Best Jewelry Armoire? In this article, we ranked and reviewed the 10 Best Jewelry Armoire on the market today. With 32 necklace hooks, this SONGMICS lockable jewelry cabinet is the ultimate fixture for buyers looking for generous jewelry storage. These hooks are specially hardened and designed to hold bulky, long and delicate jewelry in the cabinet. This implies that the space that is available to drape the necklaces must be generous or the spaces directly across from the jewelry open. Buyers will appreciate a big pocket that is the right side of this cabinet, located below the ring storage area; however it is only about 15.5″ before it blocks the area over the tray below it. You’ll find it necessary to rearrange items all the time, you may need to stash some items on the trays and hang longer necklaces over a few hooks to avoid banging against them when the door is shut. People who own it suggest that you should layer the necklaces, sharing hooks. This helps to quickly spot what’s available but definitely hampers easy access to items. The earring storage holds everything else in this category but post earrings. The double earring holes and slots are very capable of holding lobster hooks too. Each unit easily holds up to 60 rings! A set of Led bulbs washes everything in light – some sections are not properly illuminated though. This cabinet can be hung over a wood door that is 1.75″ deep. But, you’ll definitely have the need for more than one screw to keep things balanced. You might want to apply self-adhesive foam strips which are popularly used on clothes hangers. You have to put it on the opposite side of the metal hanger to prevent it from putting marks on the doors. On the downside, the hangers on this unit are not the suitable size to hang on standard bi-fold closet doors. Other than that, the lock is more secure than a backpack one and will do a seven better job when deterring the curious. Finally, it is a perfect unit for keeping a wide array of valuables. REAL GLASS MIRROR – A big real glass mirror provides more functionality. On top of a storage space, you get a mirror for those quick morning checks for imperfections before dashing out. LOCKABLE WITH LED LIGHT – 6 led bulbs with auto on and off is an easier way to spot items in not-well-lit bedrooms. They do add flavor to an already aesthetic package. WALL & DOOR MOUNTED – Wherever you want to position this cabinet is no problem, you have two options. You can choose to mount it on the wall with screws or hang it over the door with hooks. LARGE STORAGE CAPACITY – There is a spacious ring cushion, a scarf rod, two bottom drawers, five shelves, 48 earring holes, 32 necklace hooks and 90 earring slots, plenty of space and for accommodating everything. Six led lights are a good number but do less job. Not a good storage for post earrings. It needs more than one screw to mount on a wall. When running late, everything seems to magically disappear and you find it hard to locate anything. This often proves stressful especially when you are certain that you had placed a particular item in a specific place. Items such as earrings and necklaces always add a finishing touch to your attire and leaving the house without them is nothing short of a catastrophe. It is therefore important for you to ensure that they are properly stored to ensure that they are not misplaced. This means that you will need ajewelry cabinet and this article will explain to you exactly why that is. The jewelry cabinet that you will require is the Langria jewelry cabinet armoire (a wardrobe or moveable cabinet especially one that is antique). This cabinet has a 4 angle adjustable organizer that will enable you select the angle you want the cabinet to be in. Its stylish look adds to the aesthetic value of the cabinet that makes it look attractive. This cabinet is of benefit to anyone that has plenty of jewelry. This is because there is plenty of storage space for you to place all your jewelry. The benefit of having plenty of storage space is that you get to arrange your jewelry according to the type e.g. you could have necklaces in one side and earrings on another. This will make it easy for you to find what you are looking for without having to go through all your jewelry. This product is guaranteed to save you time. By putting all your jewelry in one place, you will be able to locate them with ease. The drawers previously used to store your jewelry will be free thus creating more space to store something else. The mirror that comes with this cabinet is 42 inches long and front-facing. This height is convenient for you as it will provide you with a whole vision of your appearance to help you see just how good looking you are (just try not to stare for too long). With a height of about 50 inches, the entire cabinet is neither too tall nor too short. This perfect balance is suitable for individuals of various heights. The cabinet also has a fabric lining for additional protection. This lining is aimed at protecting your jewelry against scuffing and scratching. It (the cabinet) also comes equipped with a lock that will ensure the safety of your jewelry. With all the benefits mentioned above, there also is a problem that can not go without mentioning and this is the price. The price is relatively higher when compared to other cabinets. This is not to say that it is the most expensive cabinet in the market as there are others that are much more expensive. However, this is understandable since the quality of the cabinet is also high. Comes with a full length mirror. Has a wide angle tilting design. Does not have drawers in it. Are you looking for a cabinet that is safe to keep your accessories? This cabinet is the best option. Apart from safety, this jewelry cabinet has many other benefits for its users. This cabinet is safe to keep your jewelry. Once you lock your jewelry in the cabinet, no one can access them unless you issue them with a key. This means your accessories cannot be used without your consent. If you are afraid of losing your key or share you accessories with someone else, the cabinet comes with two keys. You can have one for yourself and the other for your partner. If alone, you can keep one in a safe place while using the other. The cabinet is light allowing for easy mounting on the wall or hanging over the door. This keeps it out of reach of children, saves space, and improves the décor of the room. For those with many accessories, the cabinet is spacious enough to keep different types of items like watches, bangles, earrings, perfume, cosmetic brushes, and rings among others. The cabinet makes it easy for one to handle his jewelry in an organized way. One can easily store and remove various items from the cabinet. This is helpful for those who find it difficult to locate their favorite rings or other accessories. The cabinet allows for storage of various accessories in different areas thereby preventing them from getting entangled. This is beneficial for people in possession of the different types of accessories that may scratch each other if poorly stored. Are you looking for a cabinet with this large mirror that doesn’t contain the “fun house” effect? This is the right cabinet for you. It gives a perfect image that makes it easy for women to decorate themselves. The cabinet is also gorgeous and decent. It lights up inside when you open to increase the beauty and improve the visibility of the various accessories. It is recommended for people who want to add beauty to their houses. One of the major shortcomings of this cabinet is that it comes with two small screws. This makes it delicate to hang especially on a door. It is recommendable to use bigger molly screws to mount it firmer on a wall or door. The space between the earring rows is not large enough for oversized earrings. However, the space is sufficient for small and medium earrings, and the oversized earrings can be kept in the drawers. The mirror is covered by a film that’s hard to remove. However, upon the removal of the film, the mirror gives such a beautiful view. When new, the cabinet has a strong paint smell. This smell goes away very fast without the use of anything. Most of us are tired of searching for the bracelet they want to wear. We are constantly in search of lost necklaces or presumably, we want a more central point of organizing and storing our nicest jewelry. Regardless of the reason for looking for a new organizer cabinet, we are here for you. This is why we have brought the best jewelry cabinet in the market. This is a brand new high-end jewelry cabinet which comes with full-sized mirrors and stores all your jewelry in a neat, organized and secure manner. This product can benefits individuals and business entities. For individuals, they will use this product for personal jewelry and storage. This benefits individuals with large collection and hence would require large storage capacity. If you have a wide variety of jewelry, this is the best product for you. Businesses individual’s enterprises also benefit from the services of this products. Boutiques and jewelry shops see this product as very handy due to its design elegance. This type of clients have issues with storage and the arrangement of the products to make them elegant. In case you are planning to roll-out a chain of boutiques or make your single jewelry store eye-catching, thing no further than this new product offer. With the cabinet dimensions of 4″(L) x 14.5″(W) x 48″(H), the product provides a spacious Armoire which have the capability of accommodating 48 necklaces or bracelets, 64 pairs of earrings and 91 rings at the same time. Its two drawers comes in handy in the storage of watches, tie, perfumes and glasses. It has one rod for storage bracelets, ties and scarfs. Everybody feels bad when their item gets lost. The safety of your valuables is guaranteed with this product. The product has a lock and key for the protection of the jewelry and makeup. The product is very sturdy and hence, it will keep off burglars. There are instances when one has to buy a mirror, drawers and different sets of hangers for the different types of jewelry. A best case scenario is that the price of these will be double the price of this product. This particular product package provides a 9.75″ x 43″ mirror with a tilting design which is used by the customers and individuals to match their jewelry, clothes and desired appearances. However the problem with this product is in the fact that it doesn’t provide an option for being mounted on the wall. It is only available with a stand. This setback can be remedied as one can always find a way of mounting it on the wall since it is too heavy to hang over a door. It is heavy and hence, a stand should be used. The product has a warranty. It’s difficult to get a replacement key. Difficult to find replacement for the connecting rods. This Songmics cabinet is not like the normal wall/door mount cabinets that are static in nature. This particular product is movable and can be placed at any corner of the room as per your desire. Its real glass mirror is a plus at it gives you a clear identity and if you are looking for something real, then this is your turning point. Get all the freedom of adjusting the mirror to three different angles by inserting the provided wooden plug. This is a perfect opportunity to get all dressed up without unnecessary movements within the room. If you want an all inclusive storage product, then this cabinet will answer all your needs. Are you worried that your terrible twos and three year olds can tamper with your jewelry like mines do? Then worry no more as this cabinet gives you the pleasure of locking all your valuables intact and safe. The lockable mechanism ensures that your jewelry stay for long saving you from frequent buying and replacements. Furthermore, its storage space is big enough to not only accommodate all your jewelries but also keep them in separate apartments. You will have two bottom drawers to keep those items that are not used on a daily basis. Well placed five shelves, up to fifty earring holes and much more compartments to keep your cabinet well organized with easy accessability as you wish. The LED Light feature enables you to turn it ether on or off depending on the time of day and the quality of light within the room. Above all, it comes in a decent size suitable for a gift to your loved one. The soft velvet material nature makes it a lovely product as a gift for any occasion such as wedding, birthday gift or even a Christmas gift for your loved ones. This product contains almost all that you could be looking for in a classy cabinet though does not support wall mounting. Hence you just have to attach the leg to the cabinet before you can make good use of it. It doesn’t come with the three AAA batteries that are needed for the LED light. Here comes the revolution in the shape of a forty-two-inch-long mirror. This mirror may seem like any other lady mirror but has contents that every woman secretly dreams of: a cabinet of jewelery. 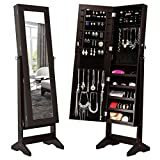 This armoire gets all jewelry out and untangles your necklaces for the very first time before you organize them in this dazzling mirror. The insides of this mirror have a black fabric lining finish for preventing jewelry from getting scratches. Necklaces, earrings, rings and other bracelets also get space. Additionally, you can also keep makeup inside, thus making your daily beauty routine of getting set faster and easier. This product comes with a lock for securing your inside goods. The locks serve as extra security for your mirror. This mirror is astonishing because of its adjustability. It has three angle positions of tilting. All you need is to choose your desired angle to attain the best view. For sure, this product is all a lady could acquire. The main reason as to why every lady should purchase this product is the solution it provides. To add on this, the ease with which this mirror is put together, together with the way the construction is done, with durable MDF material, is all reason enough to get it. The assembly manual is also in the cabinet. The frame pieces and locker nuts are available for fastening. The storage space available in this armoire hassle free gets all the jewelry you possess maintained and organized neatly in good condition. The armoire has the capacity of holding a pouch, rings, necklaces, drawers and bracelet hooks. The storage area is a phenomenon because the earrings are stored well in the rack, rather than when you store them in boxes. The length of the front facing mirror, forty-two inches, enables the user to view herself from head to toe. This view inspires the user to tone up and even lose weight when working out. This mirror is also narrow, which makes it occupy little space in the dressing area. 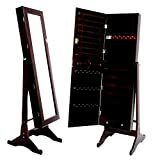 The length of this mirror gives you a wholesome vision of your appearance makeup and checking plus the ease of accessing cosmetics, jewelry, and other accessories. However, as this product provides every solution to a lady, it has a limitation. Much as it might not be an issue, lighting in this cabinet is a problem. You will have to figure out on how to shine some light on it or light the interior. This dark and black wood finishing of the interior are beautiful, but they make it hard to see. It serves more purposes than just storage; it gives a full view of the user, head to toe. It has a three angle tilt design for acquiring a desired angle of view. It has added protection and security as it comes with two keys. The assembly instructions are inside the cabinet, therefore, unless you fully unwrap it, you cannot assemble it. The armoire has been the perfect storage solution for small spaces since the Victorian era and more so for jewelry enthusiasts. The perfect armoire should look classy, complement your decor, have enough space to store all your accessories and be able to fit the space you have without looking cramped or out of place. This is what armoires by Hives and Honey deliver with high quality, beautifully designed jewelry storage pieces that are both functional and aesthetically pleasing. The Robyn Jewelry armoire embodies the Hives and Honey concept on jewelry storage concepts of high quality, vibrancy, relevance and beauty. The Hives and Honey Robyn Jewelry Armoire is made of wood and a high density fiberboard and topped off with a solid veneer and a walnut finish that gives it a classic antique look. The streamlined design also incorporates a curved front and bronze hardware that contribute to the antique treasure chest look and feel. The armoire has 8 spacious drawers with separated compartments and 2 doors that open up on the sides with 20 hooks each for your necklaces and tiny ropes that keep them in place when you open the doors. The top lid opens up to reveal a vanity mirror to help you put on your accessories with more ease as well as a technology hole for storing or charging your electronics. All these features make it the perfect gift or purchase for everyone from the most extensive jewelry collector to those who are just starting out. If you have a daughter or niece turning sixteen, it’s a much cheaper alternative than a car. It is lined with anti-tarnish felt that helps keep your jewelry safe and in pristine condition including heirlooms and antique pieces while the compartments ensure they don’t knock into each other when you open the drawers. It therefore caters to all age groups and jewelry lovers, even Iris Apfel would be able to fit her jewelry in this armoire. Standing at 41 inches in an antique walnut finish, it also makes a beautiful cenerpiece. The natural material such as the beautifully encased wood and old world craftsmanship makes it ideal for every home, complementing all kinds of lifestyles and décor. 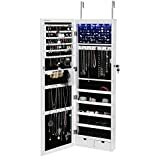 The Hives and Honey Robyn Jewelry Armoire that can be found on Amazon at https://www.amazon.com/Hives-Honey-Robyn-Jewelry-Armoire/dp/B00O1Y267Q/ solves your organizational issues, keeping all your jewelry neatly organized and easily accessible even for the mornings you are running late as well as keeping your jewelry safe thanks to the drawer stoppers that keep the drawers from coming all the way out. The dividers also keep your jewelry firmly in place while the lining keeps them protected from getting knocked around thereby keeping them safe. With all it has going on, there is one con that many have complained about; the odor. This is presumably from the glue used to hold the lining in place and can be a bit overwhelming especially when the drawers are open. Being wooden it absorbs smell and that’s why this smell is so noticeable and stays awhile. But you can let it air out after buying before throwing in your jewelry pieces especially if any are made from cloth or material that can absorb smell. So just as a reminder, here are the pros and cons. Heavy to lag around at 41 inches. A saying goes, big girls need big jewelry. So big jewelry needs needs to be kept with class and style, also with a peaceful of mind knowing that your jewelry is safe where ever they are. Hives Honey Walnut Jewelry Almoire possesses alot more than that. It’s a statement, unlike any other. This oak beauty is almost 40 inches tall and does not require any assemblage. Elegantly crafted by hand , this oak beauty have passed through series of refining by expert artisans to give it a great look and wonderful feeling while storing your jewelry. The Hives Honey Walnut Jewelry almoire has 8 slider boxes (drawers) which are lined and padded with different compartment to hold your small items and to give your item the care they need. Jewelry boxes comes in different, shapes , styles and designs, but none like the Hives Honey Walnut Jewelry Armoire. If you are a lady who loves style, elegance and desires a lot of space, that comes also wuth durability and prestige, or you are one who desires the long life span for your items, as jewelry can be so fragile and damage easily when kept wrongly.The Hive Honey Walnut Jewelry Armoire comes to mind if you have ever been in the positions mentioned above, the 8 layer slider boxes with compartments for small items and large Armoire that are padded and carefully designed to keep your priceless jewelry like necklaces, rings safe while giving them the care they deserve. This is mostly what comes to mind when wanting to buy a product. The Hives Honey Walnut Jewelry Armoire is a wonderful antique that is carefully crafted to meet your needs, be it small items like rings or even large Armoire, it will keep your items organized. The Hives Honey Walnut Jewelry Armoire is carefully crafted by hand. It consists of 8 drawers that are perfectly lined and padded to give your items the care and safety it deserves. It comes with small compartments that helps keep small items like rings and necklaces organized. A 40 inch box is quite heavy for one who travels alot with jewelry all the time, considering the fact that it can not be dissembled into smaller parts. If you are the kind of person who loves investing in different types of jewelry and you own a lot of jewelry, a jewelry box might not be the best option to hold all your jewelry. This is because jewelry boxes do not provide enough space. People who own a lot of jewelry ought to invest in jewelry armoires. 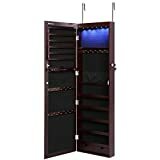 Jewelry armoires are large jewelry boxes featuring compartments, drawers, and other features to provide you with enough space to safely store all your jewelry. The challenge with buying jewelry armoires is the fact that there are numerous designs to choose from. This makes it hard to choose an armoire that would best serve your needs. Luckily, there is one jewelry armoire cabinet you cannot go wrong with; the Black Finish Wall/ Door Mount Jewelry Armoire Cabinet. Find out more about this armoire in this review. There are several reasons why you should buy the Black Finish Wall/Door Mount Jewelry Armoire Cabinet. First and foremost, this armoire does not take up too much of your living space. It can be mounted on the wall or on your bedroom door. This means you will not have to move anything or create space for it unless you have a lot of wall hangings. The other reason why you should buy this product is the fact that it provides a lot of storage space for your jewelry. It features 91 slots for your rings, 2 3 inch bracelet drawers, 36 necklace hooks, 54 earring slot and multiple drawers for other pieces. Last but not least, this armoire makes it very easy for you to access your jewelry and keeps everything neat and less crowded. 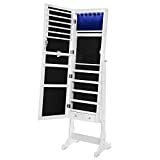 Anyone looking for a jewelry armoire that does not take up to much space and is easy to organize, durable and affordable can benefit from this product. It is also beneficial to people who own too many jewelry pieces. It helps you keep your jewelry safe and enhances the overall neatness of your room. It provides enough space for you to store all your jewelry. It is easy to organize, reduces clutter from your dressing table and it is also very durable. This means you get to enjoy the armoires benefits for a very long time. This product has all the functionalities you would need from a jewelry armoire cabinet. However, the armoire lacks one thing; its bottom drawers are not deep enough. This makes it challenging to store many big jewelry pieces. Jewelry boxes are great if you do not own a lot of jewelry. However, once you begin adding new pieces, you will have a hard time keeping your room organized due to lack of space in your jewelry box. The Black Finish Wall/Door Mount Jewelry Armoire Cabinet has everything you need to store your necklaces, rings, and bracelets away. It is spacious, durable, easy to install and most importantly, it keeps all your jewelry safe. It is definitely a worthy investment. Bottom drawers are not deep enough. You don't have to sacrifice your beauty routine to save space in your home with the Mirrotek Plaza Astoria Over the Door / Wall Mount Jewelry Armoire with Full Length Mirror. Made in America, this armoire has room for all of your cosmetics, jewelry, and other personal items. This over the door jewelry armoire measures 14W x 4D x 48H and may need some assembly. Made of wood and shatter-proof glass, this jewelry armoire can hold up to 96 rings, 48 earrings, 36 necklaces, and more. 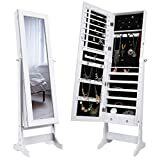 This space saving jewelry armoire comes in either a black or white frame around a shatterproof glass mirror and features hooks and drawers for jewelry storage. Mirrotek has been proudly manufacturing quality products in the United States since 1942. Well, I cannot say anything else other than exemplary and perfection when I think about this product. At first, I was skeptic about the whole capacity tag that the product has. With the ability to hold 36 necklaces, 48 earrings, and 96 rings, the product is by far the best in the market. The capacity seems like it’s exaggerated, but you got to acquire to amaze your mind with the vastness of space for this revolutionary product. You don’t have to perform DIY projects to help you store your jewelry anymore, the Plaza Astoria has got you sorted and your time can be used to create other faulty appliances at home. If you are the kind of person, who likes to try a different kind of fashion, no need to worry if you purchase short, long, bulky or slender necklaces because there is enough room for you to hang quite comfortably. It is amazing not to use a lot of effort when setting up the armoire. Typically, when one hears about having to assemble or set up a product, thoughts of having to call your local technician echoes additional dollars in your head.Well, keep the dollars safe because you have the expertise required to set up. Just unwrap the case, envision the position you want to put it and only go ahead and hang it wherever you feel comfortable. With a classy design and state of the art wood and glass finish, the jewelry armoire mimics your amazing collection of necklaces and rings in it. The amazing designers crafted drawers and hooks to accommodate your jewelry steadily and at all times. Are you specific in your finishes too? Well no problem, the artistic expertise used for the product are mind blowing with the allowance for preference. How amazing is that? One can choose from the deep shades of finishes that go hand in hand with the theme that you most relate to. The armoire doors open swiftly and close cork tightly. I am not a fan of people snooping around looking to find your items lying around afterward starting a discussion about it. Or rather, having young ones all over the place looking to find things to play with, well not my engagement necklace or ring. This trouble is taken care of by the Plaza Astoria because you can easily refrain access to your valuables. Easy to set up without any assistance. One can easily customize it to give it shift in look every once in a while. Quality finishes that will be congruent to your fashion preferences. Quality wooden and glass materials that will make ensure the shelf outlives you. Tough material constituents that ensure that it is safe when technically mounting it on walls. Difficult to open when it is closed, one has to be very keen to open from the sides. The velvet material used inside the armoire is very sensitive and can be stained with any form of mishandling. The magnet for the door can be at times weak so does not close properly.